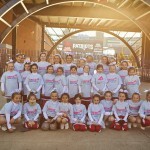 Here are the Cheerleaders at Gillette Stadium – Please click the link to see the additional pictures. Cheer Competition is this Saturday 11/5 at Wakefield High School . Competition start 2:30 – doors open to parents 2:00. Girls need to arrive at 1:00.